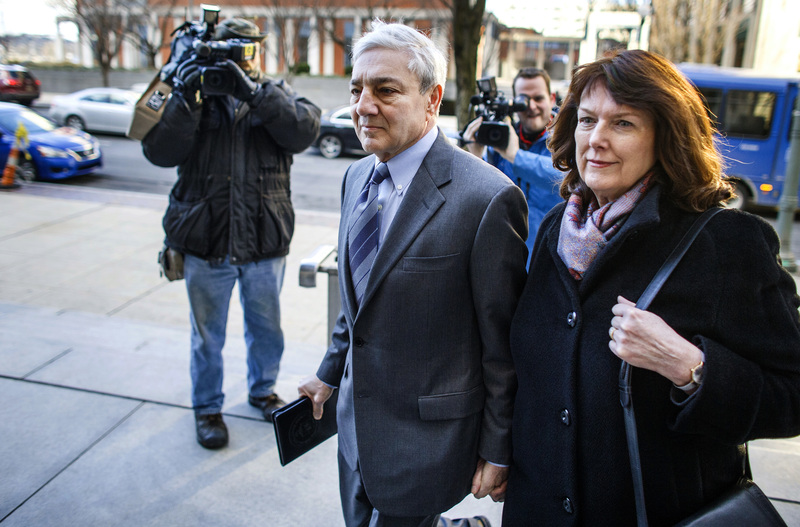 HARRISBURG, Pa. (AP) — The criminal case against former Penn State president Graham Spanier, accused of acting illegally in handling a 2001 complaint about Jerry Sandusky showering with a boy, will soon be in jurors’ hands after his attorneys declined to put on any evidence Thursday, following two days of prosecution witnesses. Spanier attorney Sam Silver argued there was “no evidence at all,” saying the case involved judgment calls by high-ranking university administrators in dealing with the complaint that a naked Sandusky had been seen showering with a boy in a team locker room. Prosecutor Laura Ditka with the state attorney general’s office said Spanier, former athletic director Tim Curley and former vice president Gary Schultz took actions to preserve the school and their own reputations, at the expense of children. Spanier faces two counts of endangering the welfare of children and a related conspiracy count, all felonies. Curley and Schultz struck plea deals last week to a single misdemeanor count of child endangerment and testified against Spanier on Wednesday. Spanier was forced out as president in 2011, after Sandusky was charged with child molestation and Curley and Schultz were first charged over their handling of the matter. Spanier was charged a year later. Sandusky has been in prison since his 2012 conviction on 45 counts of child sexual abuse, and is due in a courthouse near campus on Friday for an appeal hearing. The scandal sent shockwaves through the Penn State community, led to the firing of Hall of Fame coach Joe Paterno — who died of cancer in early 2012 — and ultimately led the school to pay out more than $90 million to settle civil claims of abuse at Sandusky’s hands. The administrators’ case has dragged on for years because of a legal dispute about their representation by the school’s then-general counsel during their 2011 grand jury appearances, and then delayed further by the death of the original trial judge. Silver called Spanier, Curley and Schultz “good men” who took seriously the 2001 complaint by then-graduate assistant coach Mike McQueary. “It’s not enough for you to find that Graham could have or should have done something differently,” Silver told jurors. He urged them to focus on testimony by Schultz and Curley that they never told Spanier that McQueary had reported seeing something sexual in 2001, although McQueary’s own testimony was that he did tell the two of them it was sexual in nature. “Mr. Schultz made clear — he, Gary Schultz, told Graham Spanier that it was horseplay,” Silver said. Spanier OK’d having Curley tell Sandusky to stop bringing children to athletic facilities and inform The Second Mile, a charity for at-risk youth founded by Sandusky. An earlier plan had involved definitely informing the state Department of Public Welfare, but Spanier approved putting that on hold, and the agency was never contacted. That failure to make a report forms the heart of the criminal accusations against him. Silver said several people knew of McQueary’s complaint, an in fact The Second Mile’s director was informed. Ditka began her closing argument with reference to the “only downside for us” quote, and repeated it several times, urging the panel of seven women and five men to convict him on all counts. “All they cared about was their own self-interest,” Ditka said, arguing the three men “let (Sandusky) run wild” despite knowing he had been the subject of complaints in 1998 and 2001. The 1998 complaint, from a woman who was upset that Sandusky had bear-hugged her son in a team shower, was investigated but the district attorney declined to file charges. Ditka said that McQueary told Curley and Schultz he saw Sandusky behind a prepubescent boy, in a dark shower at night, with his hips moving slightly. “Do you think that’s horseplay?” she asked jurors. She dismissed any idea that three of the university’s top leaders would have immediately launched a series of meetings and discussions, including a hastily arranged meeting before a women’s basketball game, if they really thought it was a matter of horseplay. “They probably could have looked into the crowd and seen horseplay,” Ditka said. She noted that Spanier’s academic background should have prepared him to deal with the matter. “For God’s sake, he’s a family and child therapist. Got a PhD in it. They knew exactly what to do,” Ditka said. Jurors were expected to begin deliberations after getting instructions from the judge Thursday afternoon.